looking for more Carpet Repair Jobs? If so...GREAT! We need you. We are the largest national carpet repair business in the United States. Over the past 10 plus years, we have built a team of professional carpet repair experts who are committed to upholding the highest level of integrity in the carpet repair industry. In addition to our growing team of carpet repair experts, our support staff in the office work harder than a momma beaver on the last day of fall to create an environment that supports both our customers and our contractors in the most professional manner possible. Plesae check out Our Grand Promise below. You can see that we mean business and upholding our grand promise is our number one goal. Feel free to check out our Creative Carpet Repair website also to get a feel for who we are as a company. By the way, we never, ever charge you to become part of our nationwide network. Our customers call us and schedule actual appointments and we send YOU out to do the work. We aren't a scam company that charges you for the privilege of working for us. We believe that we should earn our money when you earn yours. Our suggestion is when you find a company that wants to charge you for leads before you can make any money, run! I'm Steve Gordon...owner of Creative Carpet Repair. Why did I start Creative Carpet Repair? Because after decades of experience as a carpet installer, I couldn't keep up with the hard work of installaiton anymore. My knees hurt, my back hurt, I was exhausted after a day of work. Lets face it, there's no easy way to grow older as a carpet installer, unless you become a carpet repair expert. When you become one of our carpet repair experts, you become a trusted, respected, valued member of our team. We've made it easy for you to get work, get paid and keep working until you're ready to quit. All we ask is that you're honest, do a great job, are respectful of our/your customers and well, if you have a sense of humor about life and all that it entails, that's a plus! I'm not talking about getting rich. I'm not even promising that you'll be able to support yourself and your family by working with us, however, you can make decent money without having to work yourself into an early grave. "My experience working for Creative Carpet Repair has been nothing but positive! I`m a retired residential carpet installer (almost 40 years) And this has been perfect for me! Steve and all the gang at the office are top notch and friendly! The leads are always good And I usually can set up appts. that work for them and myself. If I can`t take on a job for whatever reason, there is never any problem, and they are very understanding! I am very happy to be working for them, And hoping for lots of repair jobs to come!" 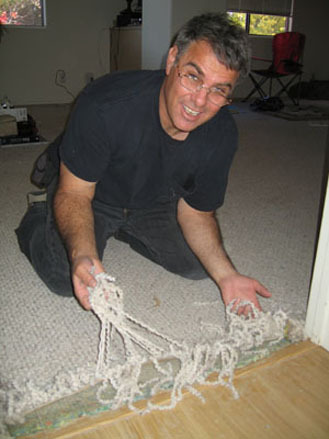 We have carpet repair jobs available all around the country and we're looking for qualified carpet repair contractors. If you think you qualify, please complete and submit the form below and then call us. We want to hear from you. I have been working with Creative Carpet Repair around two years now and have been in the carpet and flooring business for 23 years. Creative Carpet Repair (CCR), is by far, hands down, THE best company I have had the honor to work with. Steve has a lot of good ideas, many of the customers comment on the informative videos that he has posted. I may be wrong, but I have never even heard of a company that offers lifetime guarantees on all repair work. Even Home Depot gives only a one year labor guarantee on installations, they do not offer repair work. I appreciate that, I have fixed many Home Depot installations. As a representative of CCR, I have never had to return to a repair under our guarantee. The integrity of Creative Carpet Repair is exceptional, as I have always been motivated to do the finest work possible- you know what they say "do it right the first time", I let our reputation speak for itself. The folks in the office are the best you can get. The customer info. is emailed, then you get a follow- up confirmation call. They also do follow- ups, to ensure that our customers have the finest experience that we, as a company, can provide. They stand behind their contractors. I have worked with companies that want to fire their contractors over the comments of one customer. Companies like that do not understand the nature of their business. Our customers are more like our friends, not our bosses. We are here to help them. If a problem comes back- we come back- for free. One more thing, don't ever worry about getting paid. 95% of the leads you go on, are jobs. Bring all of your gear and supplies- you are going to work. Many folks aren't aware that their carpet can be repaired in lieu of replacement. We solve the problem, with creative solutions. There aren't any hidden surprises with CCR, like charge-backs, or invoice costs, and your 1099 is always on time. Steve will post my number- feel free to contact me if there are any questions or doubts. This is a fine company gentlemen. I will be here a long time." We get paid when the job is finished and the customer pays us, we then pay you your percentaage by direct depposit, normally within 5 business days. Too many companies charge contractors for leads that never pan out. We don't like those types of businesses and want our business to be different. 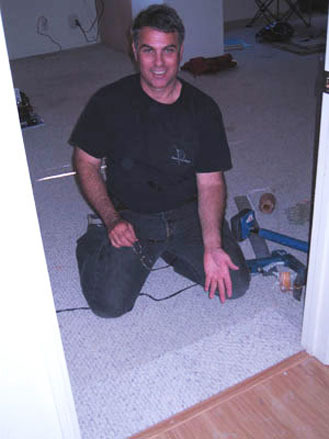 "Creative Carpet Repair is the best company I've ever found to work with and Steve Gordon really gets it! He pays his contractors first. I send in my invoice and he pays the very next day. I've worked for companies that hold my money for 2, 3, or 4 weeks before they pay me and that is so demotivating. Steve pays right away. You can't get any better than that." After you've been approved, we send you a package on our dime that includes the customer invoices and business cards. After you submit the form below and call us, if we believe that you're the type of person we're looking for, we will e-mail you an independent contractors agreement. The agreement explains everything about the way the company works. There's nothing left out. We created this agreement to be all-inclusive so that by the time you read and okay this document, you will fully understand everything that's important about getting carpet repair jobs with Creative Carpet Repair. We run a straight-up, honest company and we won't be helping you cheat on your taxes. Before getting paid for your first job, you will need to provide us with a form W-9 so that we can send you a 1099 at the end of each year. You will be responsible for taking care of your own business including supplying your own truck or van, tools, extra help, etc. You will not be an employee. Where do we get the carpet repair jobs we give you? We own the largest carpet repair website and the largerst carpet repair company in the USA. Customers call us from all over the nation when they need the best carpet repair contractor. How do you get the carpet repair jobs? We don't make you wait for weeks or months before you get your money. When you do a carpet repair job for one of our customers, you will be paid as soon as possible. When you fax or e-mail the paperwork to the office, in most cases we'll process the paperwork and the payment the very next business day. This doesn't mean that you will actually receive your money the next day, no, it means that we will pay you using our online bill pay service the next business day. When you choose to be paid by check, it'll normally be in your mailbox within 5-7 business days. If you would like your money more quickly (like most of our contractors) you can choose to be paid by direct deposit and your money will be in your account within 2-3 business days. spite of any outside influences. The first step in becoming one of our trusted carpet repair experts is to fill out this form. We will normally call you within a day of receiving it (except for over the weekend as we more than likely hanging out with our families). Please describe your experience in the flooring industry. Do you have any disabilities that interfere with your ability to perform carpet repairs? How are your knees? How's your back? Are you fit? What else would you like me to know about you and/or your experience that would make you one of our Creative Carpet Repair Experts? If hired do you promise to abide by the Creative Carpet Repair Code of Honor as listed? Clean your mess after you finish and leave each job vacuumed? Always be on time, if you are going to be more than 2 minutes late you will call the customer and let them know when you will be there. To unconditionally guarantee your labor for the life of your carpet. Show up dressed clean and professionally. To only hire legal U.S. Citizens. Use only the highest quality supplies and materials. Always be courteous and polite to our customers. Answer your phone and if you can’t get to the phone, call us back within a couple of hours. Respect our customers, their family and their home. Stay current with all the best products, systems and training available. Never use any illegal drugs or alcohol when you are working with our customers. Not smoke on the customers property. Keep your word with the company and the customers at all times. If you need to make a new agreement, you do so before breaking your word. *If you are a contractor and you want to find out how our other contractors feel about our company, call one or more of our men below. Ask them about the leads, how we pay, etc. I've been doing work with Creative Carpet Repair for about a year now. Leads are good, free, & frequent. The pay is usually within a couple of days and the staff is very helpful, happy & easy to deal with. I am happy to say I am a Creative Carpet Repair Contractor. I like working for Creative Carpet because they pay fairly and quickly. Staff is knowledgeable and helpful, and almost all of the leads result in work. All of the forms used are provided to me free of charge. I appreciate being part of the successful Creative Carpet team! Hello, my name is Jason Frank and I am a contractor for Creative Carpet Repair. Going into this I was a little unsure, especially with the company being out of California, but what I found out very quickly was that Steve and Scott are awesome individuals to work with. The leads are amazing. I have been with them a little over 6 months and there isn't one job I went to that I wasn't able to get the job. I have also not had any problems when it comes to getting paid. Always fast and the amount agreed upon. After being here for a while I have also noticed that these guys are willing to go out of their way if I'm in a jam and need some extra expense money without blinking an eye. I really enjoy working with these guys and will continue for a long time to come. This is a real testimony from a real contractor. Feel free to call with any questions regarding how great they are. I'm a contractor working for Creative Carpet Repair in the Virginia area. I am extremely happy with my position and my pay. This job allows me excellent flexibility to do my own jobs as well as complete the repairs assigned to me. I have never had one problem dealing with Steve Gordon or receiving my pay... Never, not once! Their office team is the best I have ever worked with hands down. I am always happy to do service or to do work for a company that has my back. I have always been reimbursed for any money I spent in supplies and I can tell when someone is happy to pay me. A lot of people want you to do work but they really don't want to pay. Any time I've worked with Creative Carpet Repair I've been treated fairly with the utmost respect and I hold them in the highest esteem. I say these things of my own free will with nobody's help or coaching. I am very happy to have found Creative Carpet Repair. It has been an absolute pleasure doing business with Creative Carpet Repair! They are Professional,Courteous, and Extremely Prompt. One of the best companies I have dealt with in a long time! HIGHLY RECOMMENDED!!!! !